Ja Rule has broken his silence on his shockingly disastrous music festival, Fyre Festival. The rapper took to Twitter on Friday afternoon to release a statement in response to the uproar over the conditions at the Bahamas-based festival. Earlier on Friday, photos of the disorganized event site went viral after festivalgoers called out the false promises made by the organizers about the luxurious nature of the event. The people running #fyrefest just told the pilot to not take off because they are having colossal problems. Everyone is stranded in Miami. With trash everywhere and lodging conditions nowhere near what organizers promised, festivalgoers were up in arms over what they arrived to on Thursday night. Blink-182, one of the musical guests slated to perform, pulled out of the gig, saying that they weren't confident in the event. 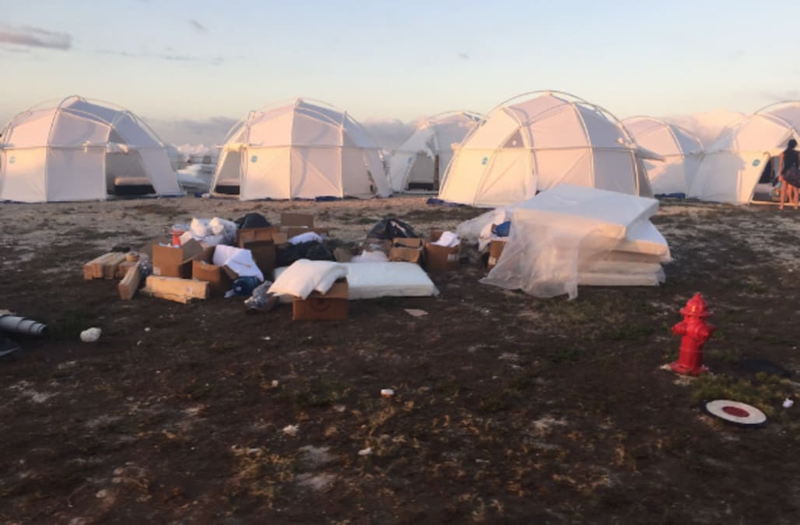 Fyre Festival has been indefinitely postponed and people who bought tickets are expected to be fully refunded as they fly back to Miami having not seen one performance. (L-R) Ja Rule and Mike Keyser attend Bottles And Strikes at Chelsea Piers on October 6, 2010 in New York City. Ja Rule films on location for 'Goat' on the streets of Garfield on October 19, 2010 in Garfield City, New Jersey.